Here are some stories about what I've been up to and places I've been. Some of my other stories have become articles in the Parish Magazine, you can read them all again here. I've also been on a holiday to Northumberland. This is a county in the north of England and has a lot of history associated with it; mostly involving Romans and walls. 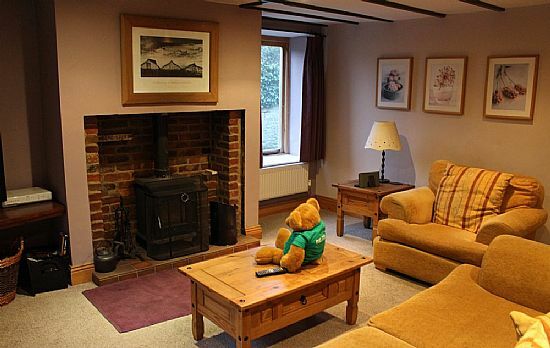 I stayed in a cottage which was very cold upstairs. Luckily it was cosy and warm downstairs, so that's where I stayed (with the TV remote!). I had some sunny days, and on one of them I was driven to Maryport in Cumbria and I went to see the sea but it was out [snigger]. I had my photo taken anyway. I visited eight churches called St Mary's. I've written about them and put photos on my St Mary's Churches page. The last church I visited on my holiday wasn't a St Mary's, it was called St John's church and was in a place called Healey (Northumberland). It had lots of different stained glass windows including two really modern ones that Uncle Les photographed for me. He had to take one photo from the outside 'cos you couldn't see the funny clouds in the glass from inside. 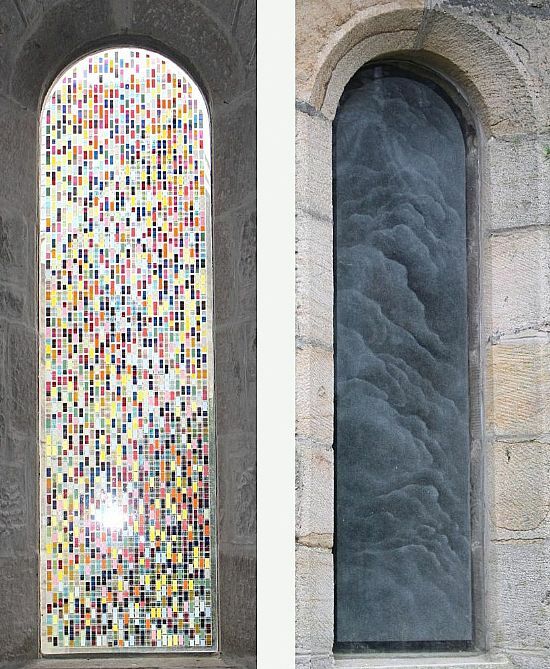 The church has won a prize for these two windows: the ACE Award for Art in a Religious Context (see ACE website). The window on the left in my picture is called "Contrary Rhythm" and the one on the right is called "Untitled" [which is just silly]. 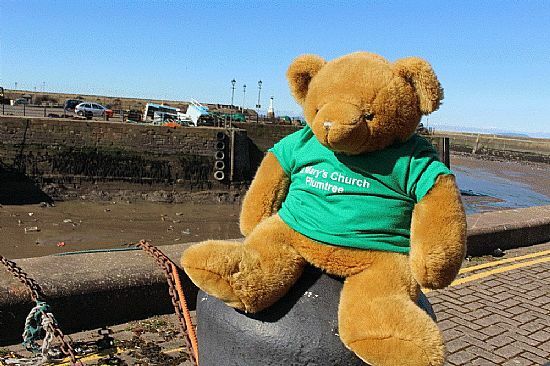 Some Sundays people come to church especially to visit me [I really don't think that's quite why they come to church, Big Ted!]. Here are some of them. 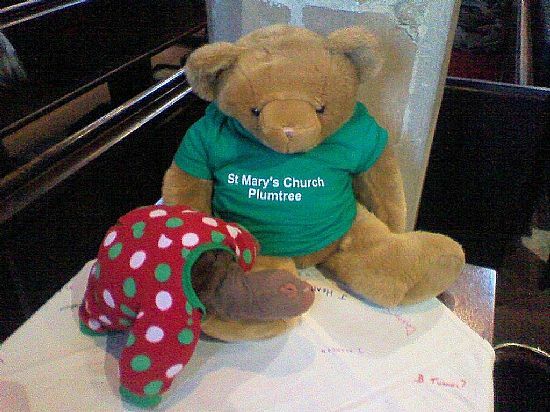 One Sunday in November I was visited by Titch the Tortoise in the Children’s Corner in Plumtree Church. He came all the way from The Elms School in Long Eaton, where he is class 3CL's 'pet' / mascot. He was staying with Kiki for the weekend and she thought we should meet. We had a lovely chat. Tich says that it's very tiring being a mascot for schoolchildren. Here’s a photo of us together in church. 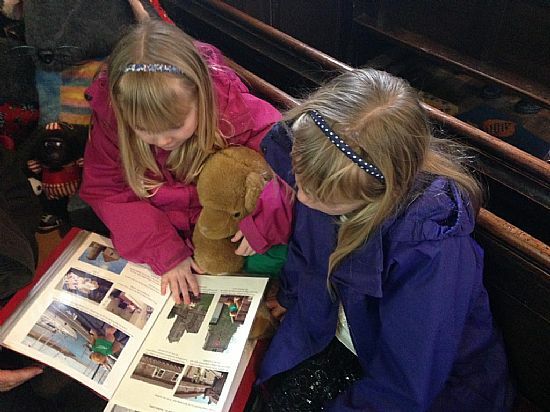 Then, in January, on a snowy Sunday, I had two more visitors to the Children's Corner. They were both very interested in my travels and I showed them some of the the pictures in my book (it's called Big Ted's Book and it describes all my exploits. You can read in the Children's Corner). Auntie Jackie took a photo of us all together. Then, another time, I went on holiday to a place called Lavenham in Suffolk. I stayed in a very old cottage called Wool Cottage. It is part of a medieval house that was owned by a wool merchant in the 1500s. 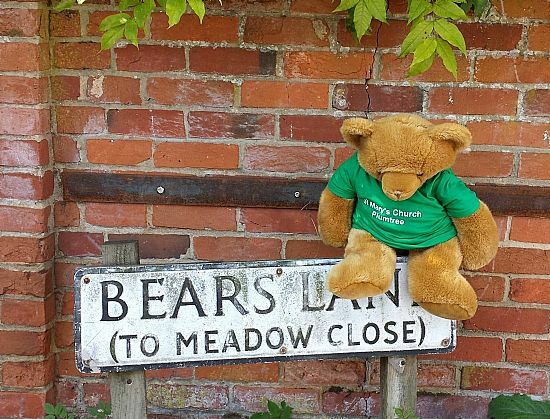 The cottage was on a road called "Bears Lane" (I thought that was really funny - I'm a bear you see and the road name had "bear" in it so it's really my lane). 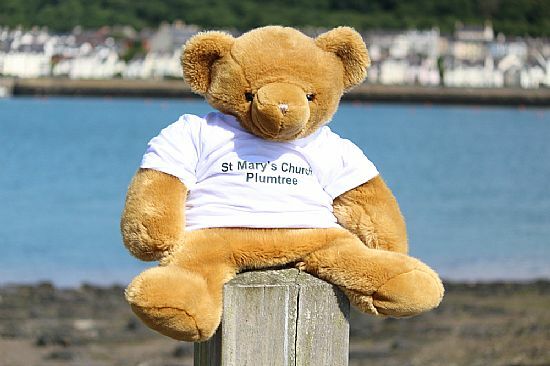 I visited lots of churches called St Mary's (just like Plumtree church). 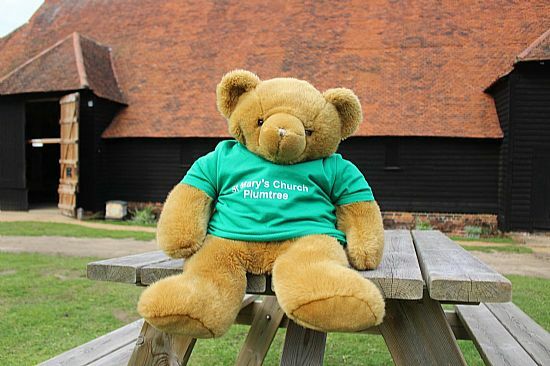 You can see all the photos of them on my St Mary's Churches page. I also went to Essex (which is next to Suffolk, which is next to Norfolk - snigger) and visited Grange Barn in Coggeshall. This is one of Europe's oldest and biggest timber-framed buildings. And it is really, really, really, really, big! Here's a picture of me sitting a long way in front of it and you still can't see it all. All these churches and things; I was glad to get back to snooze in the Children's Corner. One time I went to a place called Bangor. This is in a completely different country from Plumtree, called Wales (I'd never been to another country before). Bangor has a cathedral which means it is really a city, but it's more like a small town so it's called one of the smallest cities in Britain. It was a bit windy and cold in Bangor, but it has an excellent pier that I visited. It is a really long pier and it reaches a long way out into the Menai Strait, nearly to an island called Anglesey. The next day I went on a trip to visit Anglesey. I stopped at a place with a very, very, very, very long name. It's so long and complicated they have to put writing on the bottom of the sign at the railway station that tells you how to say it! The weather finally got sunny and warm, so I went to the seaside in Anglesey. I found a handy post to sit on and I looked back at Wales on the other side of the Menai Strait. The cottages in the distance aren't really all fuzzy to look at. It's just that Uncle Les, who took the photo, thinks it looks more artistic. But I just think it looks fuzzy myself!